Guardamar del Segura is a fantastic place to buy a property whether you want to buy a property for a holiday home or whether you intend to relocate to Spain. With large expat communities all around the region, information and support to help you settle into your new home is readily available. Properties in Guardamar tend to be a little more expensive than those of neighbouring towns, but once you see its breathtaking beaches and taste what it has to offer, you will understand why. The ex-pat communities, usually living in the large urbanisations locally, are a valuable source of information on the local amenities and facilities, including schools for the children. Typically, the urbanisation developments are built near to golf courses and have community swimming pools, local shops, bars and central commercial areas including banks and local services specific to the community. This makes an urbanisation an excellent choice for families with children. Many of the beachfront apartments are holiday homes, with the many permanent residents tending to live in town, closer to the local shops and amenities. Housing is varied, with own houses and apartments, to luxury beachfront apartments and typical Spanish fincas to be found when exploring a little further afield, as well as the larger urbanisations nearby, such as El Raso, Dona Pepa, Pueblo Bravo, Lo Pepin. Surrounded by orange and lemon groves and fertile vegetable gardens, the ancient settlement of Guardamar at the mouth of the Segura River is a thriving small town and summer resort. The area was occupied by the Romans before becoming a major Moorish religious centre, known as Rabita Califal. The Christians ousted the Moors in the 13th century and built a castle and a church. The village developed into a fishing and agricultural centre, its peace only being disturbed by an 1829 earthquake, when it was built further away from the river. Parque Reina Sofia (Queen Sofia Park) is one of Guardamar's many lovely parks and a great place for a picnic. 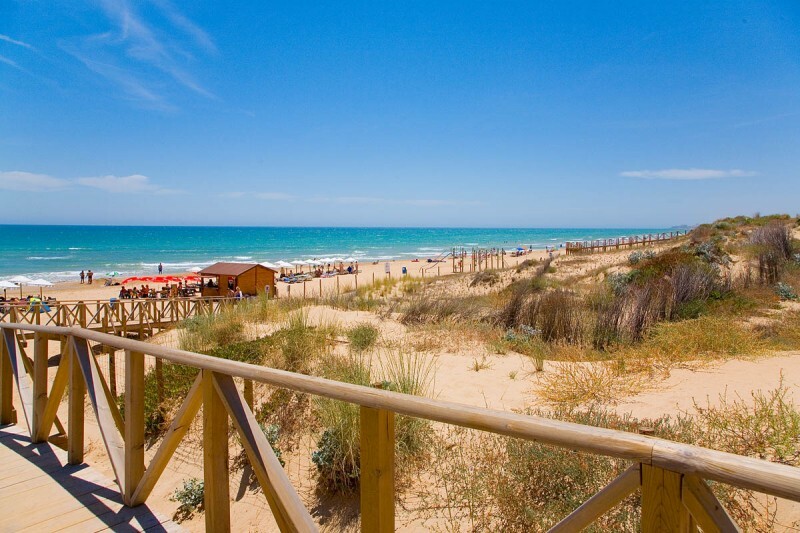 La Gola, where the river meets the sea, is great for water sports; and the Parque Natural de Laguna de La Mata, which includes La Mata salt lake, is a popular area for horse riding, cycling and walking. It is worth visiting the Casa Cultura (House of Culture) which houses many historical artefacts from Guardamar’s past. Guardamar is surrounded by the dunas – the rolling sand dunes for which it is famous, along with its pine palm and eucalyptus trees. Wooden boardwalks lead you through mature bamboo plantation, opening out to a breath taking view from the dunes along the far reaching 12km fine sandy beach. The beaches here in Guardamar are some of the loveliest on the Costa Blanca. They are cleaned daily and are perfect for water sports such as wind surfing, water skiing, diving and jet skiing or simply for sunbathing. The beaches at Guardamar del Segura include Los Tusales (a nudist beach), Los Viveros, De la Babilonia, Playa Centro, La Pineda, La Roqueta, El Moncayo, Playa Del Campo and Les Ortigues. The spring and summer see a string of festivals and fiestas in Guardamar, with thriving large street markets on Wednesdays and the renowned Guardamar Lemon Tree market on Sundays. Guardamar has extensive sports facilities including an Olympic sized pool, football pitches, basketball, tennis and pelota. The Marina del las Dunas is a wonderful addition, offering nearly 500 moorings, with all the services and facilities of a top ranking marina. Guardamar has numerous bars, buffets and restaurants, catering to all tastes, with typical Spanish food and tapas bars and quaint coffee houses on most streets. For those wishing to travel a little further afield, the historical villages of Murcia, Cartagena, Orihuela, Elche and Alicante are close by. The river Segura has cycling pathways leading all the way to Rojales and a cycle path to the marina. Guardamar Del Segura attracts families, nature lovers and golfers. It is a developing tourist resort and one of the most important on the Costa Blanca. Guardamar del Segura is not as heavily commercialised as some of the other resorts and therefore retains some of its typically Spanish charm. During the summer, daily temperatures average over 30 degrees centigrade and rarely drop below 15 degrees in the winter, making an apartment in Guardamar Del Segura ideal for golfing breaks in the winter sun. The nearby towns of Rojales, Ciudad Quesada, Almoradi, etc have La Marquesa golf course and La Finca and Villamartin golf courses nearby. With over 320 days of annual sunshine, it is the ideal escape from the bleak British winters. The healthy micro-climate created by the salt water of the Salinas de Guardamar is recommended by doctors for a variety of ailments such as aching joints and respiratory problems. See below to view a selection of our bargain properties in Guardamar.